Friction drive toys by ELM. 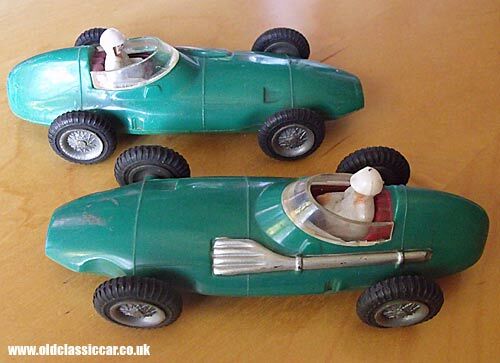 Toy versions of the classic Vanwall Grand Prix car came in numerous sizes, from a variety of manufacturers during the late 1950s and early 1960s. 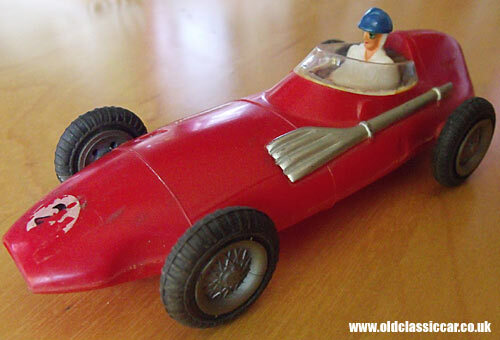 Perhaps the best known of the lot are the Dinky Vanwall (code 239), and, also in diecast, the similar toy from Crescent. By the early 1960s, there was a definite switch from metal to plastic toys underway, with many plastic toy cars emanating from factories out to the East. The toy Vanwalls shown above are classic examples. All are stamped "ELM Toys - Empire Made" underneath, suggesting that they were probably made in Hong Kong. The bodies are made from moulded plastic, and each incorporate a friction drive motor. Originally they'd have all sported Vanwall transfers, plus a couple of racing numbers, but only the red toy still shows signs of these now. Treaded rubber tyres are fitted, as are drivers wearing appropriate headgear for the era. As well as the Vanwall, other classic GP cars of the '50s were also produced by ELM, such as the rear-engined Cooper, which will feature on the site soon.